Eleven-year-old Ralphie Parker knows what he wants for Christmas. He begs his parents to buy it for him but when they say they won’t he takes his plea straight to the top: Santa Claus. “What do you want?” Santa asks. Santa’s response—“You’ll shoot your eye out, kid”—is one of the most memorable lines in recent cinema history. A Christmas Story is so popular that television networks broadcast it 24 hours a day during Christmas. 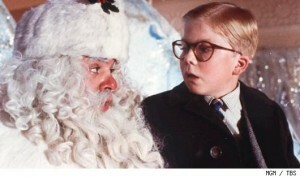 In the movie, Ralphie lacks patience, and he is not even willing to consider another present. “How about a nice football?” Santa asks him. Not on your life, Ralphie replies. And I’m not waiting until next year. I want what I want when I want it and I want it now. We are now three-quarters of the way thorugh Advent. Gaudete Sunday, as today is known, is developed from the buoyant Scriptures that announce that Christmas is near. We light the third candle in the Advent wreath, the rose-colored candle, and the priest is permitted to wear rose-colored vestments. The entrance antiphon at Mass is taken from Saint Paul’s Epistle to the Philippians, the so-called “letter of joy.” “Rejoice always! I say it again: rejoice! The Lord is near” (4:4-5). During Advent we are devoted to spiritual preparation, to receive Christ at his birth and in his glory. To appreciate Advent requires openness to the Spirit, the giver of all gifts. And it requires imagination borne from a healthy faith secure enough to envision what cannot be seen beneath the Christmas tree, namely eternal life. The gifts of the Spirit themselves are the true presents for which we dare to hope and to pray. They make it possible for us to enter into the Great Reality but it does take work. The Nativity is easier to envision because the image of the baby Jesus in the manger is familiar and endearing; some malls or schools or city halls even continue to display the crèche. The Rapture, on the other hand, does not exactly fit on a greeting card, does not make for a Hallmark moment. Christianity is a mystery. Like gift-giving, we don’t know what to expect, and we can’t necessarily lift the wrapper or peak at what’s under the tree. Openness doesn’t mean an unwrapped present. It means remaining grateful and willing to want what we have even if we Santa Claus doesn’t bring us what we want. Rooted in our past, we look forward to the future coming of Christ and wish it to be our present. As the saying goes, the past is history; the future is a mystery; today is a gift and that’s why we call it the present. That, I suppose, could fit nicely on a greeting card, a Hallmark slogan for the Rapture. Patient waiting for the unseen is our heritage. “Who hopes for what one sees?” Saint Paul asks in Romans 8:24. “What is seen is transitory. What is unseen is eternal”(2 Corinthians 4:18). The first generations of Christians believed that Jesus would return in their lifetime and they prayed ceaselessly to be taken into heaven when he appeared. According to Paul, the gifts of the Spirit can only be received into hearts opened to God’s promise with gratitude, thanksgiving, and praise. The gifts themselves, Paul says, create such openness. “Rejoice always. Pray without ceasing. In all circumstances give thanks, for this is the will of God for you in Christ Jesus” (1 Thess 5:16-17). Paul wasn’t wearing rose-colored glasses either. He doesn’t deny the reality of suffering in life, nor advocate a false sense of happiness. The joy that Paul proclaims comes from knowing Christ the Lord and prayer and gratitude go hand in hand. During Advent the Church includes selections from the Thessalonian letters in the lectionary because of their teaching on the Parousia. These letters are believed to be the earliest New Testament writings. Each Sabbath Paul entered the synagogue and proclaimed to worshippers that at any moment Christ would return. Ancient Christians hoped for the immediate return of Jesus but as time waned the hope diminished. The endless waiting caused many to doubt God’s promise. Many still feel that way. But the birth of Christ did not happen overnight. The coming of God’s Son was so great an event that God took centuries to prepare the world (CCC 524). First Thessalonians offers assurance that the delay of the day of the Lord is itself God’s gift—more time to prepare to receive the good news. Why the delay? Jesus says, “I am coming soon” (Rev 20:20). But when? Paul claims that God’s mercy is so great that he offers ample ways to receive him. To the one who has, more will be given. From the one who has not, even what they have will be taken away (Mark 4:25). The first time we left no room for him at the inn and he slipped into the world during the cold blue night. The next time we won’t fail to notice. Advent is a special time in our church and it deserves attention, reverence, and devotion. For Ralphie, his wish does indeed come true: he gets his gun—and nearly shoots his eye out. It didn’t take a prophet to see that coming. For us Christians, we must keep our eyes on the sky. Gaudete Sunday marks a turning point during this joyful season of two-fold preparation, when we welcome the Son of Man into the world, first in the flesh, then forever after in the Spirit. Saint Peter reminds us that, “there is no time with God; a single day; a thousand years, it is like one day” (2 Peter 3:8). With Christ everything converges and there is no future nor past, only the continual present with the Word. The gifts we receive from the Spirit—gratitude, willingness, and joy—enable us to receive the answer to our prayers. Imagine that, something even the person who’s difficult to shop for can use. This is the title of the book, written by Jean Shepherd, on which A Christmas Story is based.